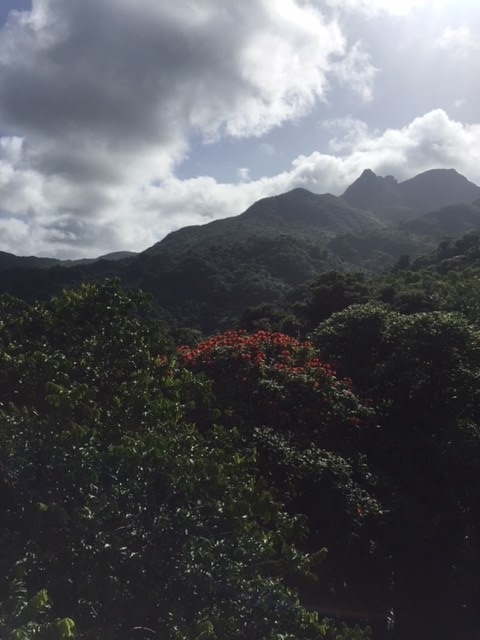 On the last full day of our trip, Bennett, Davis and I rented a car and drove up into the mountains to the Puerto Rican rainforests. I was a bit nervous as I knew it was a long hike, and it was also suuuuuper hot, but it was such a great experience. I'm glad we went. First of all- the hike was about 30 minutes down, and then 30 minutes back up, so it wasn't bad at all, and second of all- once you got into the cover of the trees, it actually felt very cool. We had to coax Davis to go with us instead of staying with Honey and Holden, but once he got there, he was really excited to find vines to swing on like Tarzan. Before getting on the trail, there is a huge tower, called Yokahu Tower, with a winding staircase all the way up to probably 5 stories up, and this height, paired with how high you already are in the mountains, gives you the best view. You can't really capture the breathtaking expanse in a picture, so just know it was this times 1000. This was at the start of the hike...we went down, down, down until we got to a beautiful waterfall at the bottom. 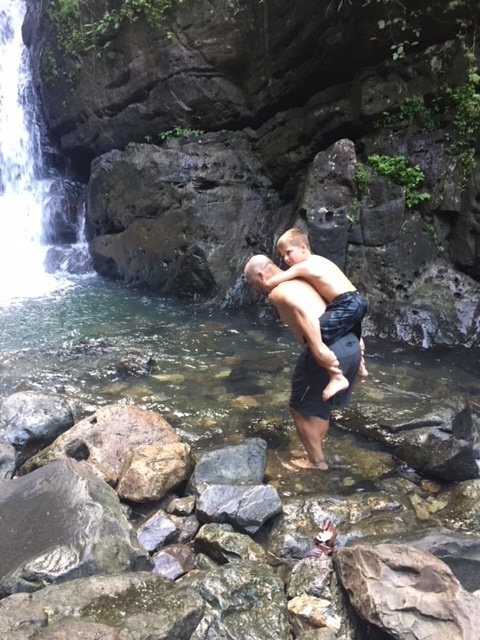 Of course both the boys got in- but Davis slipped on a rock and smacked his head on another rock and I thought "Oh Lord, we're going to have to be helicoptered out of here" but he has a hard head and we were fine. It was an awesome experience. And to be honest- it was Bennett's idea and he really pushed to get us there. Embarrassingly enough- I thought I would rather just sit by the pool another day- but I decided to go- and I'm glad I did. I would have missed this whole experience!?! I'm trying to say "yes" more and push myself more- and so far- it's really proving to be fulfilling. We don't have to be who we were yesterday.